Professor Seth Garfield (Department of History and director of the LLILAS Benson Brazil Center) was one of three scholars interviewed recently on AHR Interview about the devastating fire that destroyed the National Museum of Brazil in Rio de Janeiro. AHR Interview is a production of the American Historical Association (AHA) and the American Historical Review. Also interviewed were Natalia Sobrevilla Perea (University of Kent) and Mariza de Carvalho Soares (Universidade Federal Fluminense de Rio de Janeiro). 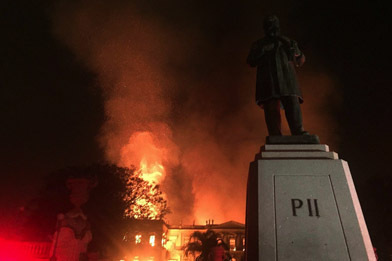 Garfield was one of the participants in the late-breaking session "Archives Burning: The Fire at the National Museum in Rio de Janeiro and Beyond" at the annual meeting of the AHA in January 2019. Listen to the interview at The Fire at the National Museum. The LLILAS Benson Brazil Center offers a roster of scholarly events every semester. For more information, consult the LLILAS Events Calendar.